Compass 2 click carries the AK8963 3-axis electronic compass. The AK8963 sensor is based on the Hall effect. 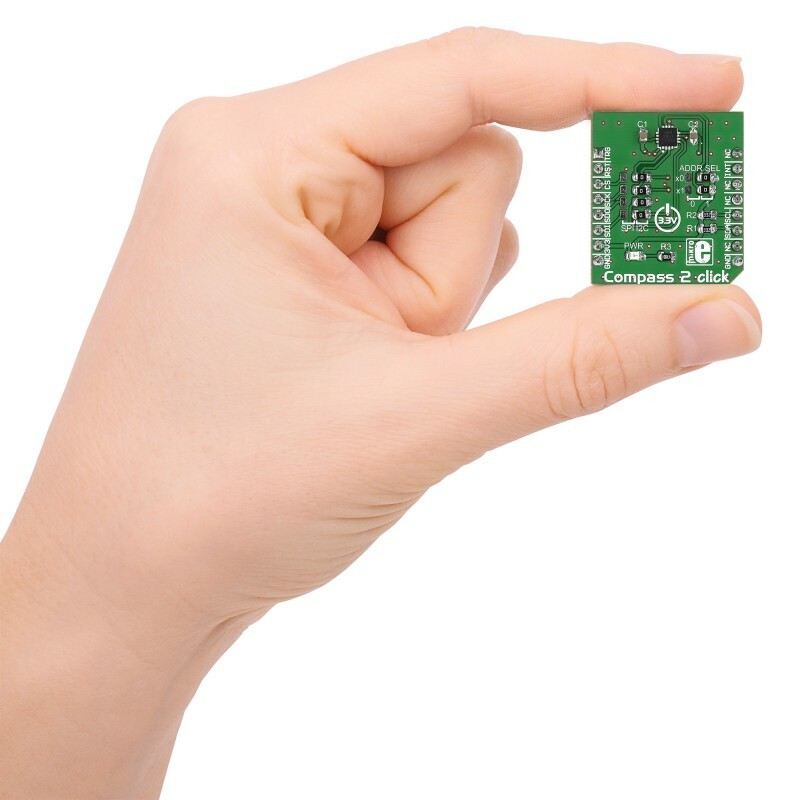 The click is designed to run on a 3.3V power supply only. 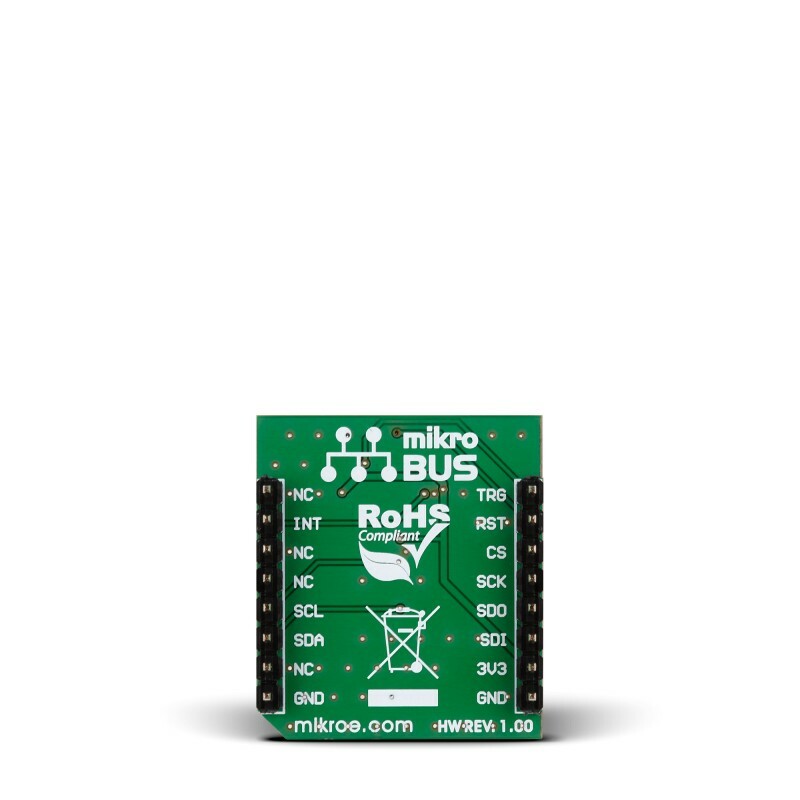 It communicates with the target microcontroller through either I2C or SPI interface, with additional functionality provided by the INT pin on the mikroBUS™ line. 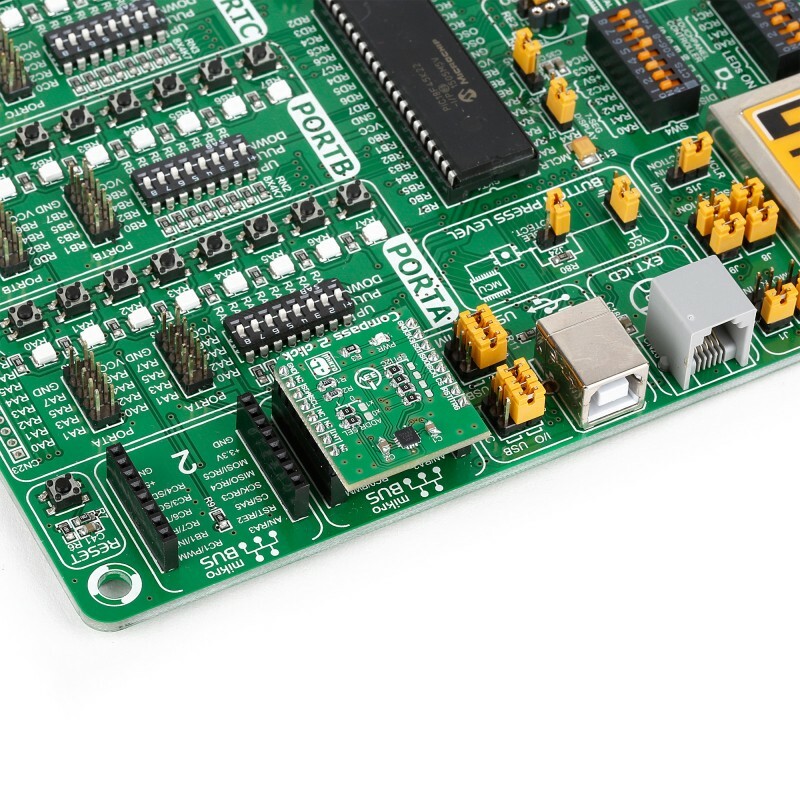 The built-in ADC converter can be set up at either 14 or 16 bit resolution, for each of the 3 axes. The sensitivity is 0.6µT/LSB typ. at 14-bit, and 0.15µT/LSB at 16-bit. AK8963 incorporates magnetic sensors for detecting terrestrial magnetism in the X-axis, Y-axis, and Z-axis, a sensor driving circuit, signal amplifier chain, and an arithmetic circuit for processing the signal from each sensor. This table shows how the pinout on Compass 2 click corresponds to the pinout on the mikroBUS™ socket (the latter shown in the two middle columns). Power to almost all internal circuits is turned off. All registers are accessible in power-down mode. However, fuse ROM data cannot be read correctly. Data stored in read/write registers are remained. They can be reset by soft reset. When single measurement mode (MODE[3:0]=“0001”) is set, sensor is measured, and after sensor measurement and signal processing is finished, measurement data is stored to measurement data registers (HXL to HZH), then AK8963 transits to power-down mode automatically. When continuous measurement mode 1 (MODE[3:0]=“0010”) or 2 (MODE[3:0]=“0110”) is set, sensor is measured periodically at 8Hz or 100Hz respectively. When sensor measurement and signal processing is finished, measurement data is stored to measurement data registers (HXL ~ HZH) and all circuits except for the minimum circuit required for counting cycle lentgh are turned off (PD). When external trigger measurement mode (MODE[3:0]=“0100”) is set, AK8963 waits for trigger input. When a pulse is input from TRG pin, sensor measurement is started on the rising edge of TRG pin. When sensor measurement and signal processing is finished, measurement data is stored to measurement data registers (HXL to HZH) and all circuits except for the minimum circuit required for trigger input waiting are turned off (PD state). Fuse ROM access mode is used to read Fuse ROM data. Sensitivity adjustments for each axis is stored in fuse ROM. 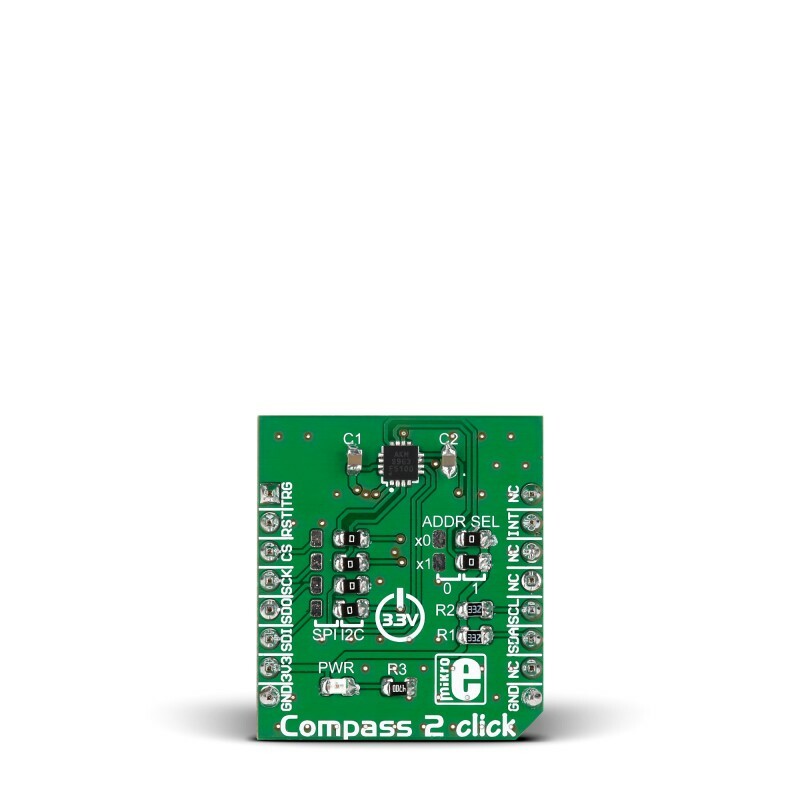 Compass 2 click has both SPI and I2C interfaces. The active interface is configured with onboard jumpers. If you use I2C, an additional jumper will allow you to set the I2C address. This code snippet initiates Compass 2 with I2C communication, and reads out the heading value, along with a direction, ( N, NE, E, etc ) from the module to a UART terminal every 100 ms.